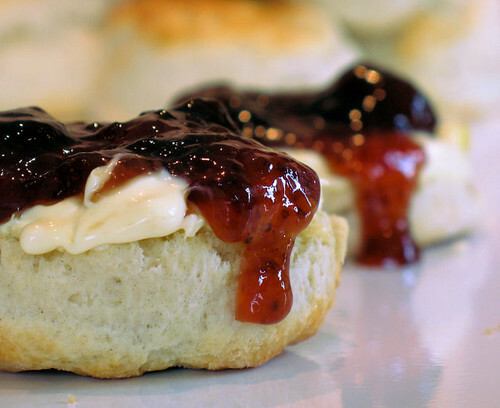 Cherrapeno: Jammin' with British Scones and Clotted Cream! There is a wonderful British tradition, afternoon tea. In times gone by, it used to be more of a light meal - a pot of steaming hot tea and tiny sandwiches, cakes and pastries - taken between 3 and 5pm. Nowadays, the more formal afternoon tea is only served on special occasions, in hotels or when friends pop round. Cream teas are more popular, and can be found in every tea shop. At the weekends, we quite often stop for a mid afternoon cuppa and a biccy, recharging our batteries after slogging in the garden. It's a treat to have a cream tea - warm scones, clotted cream and strawberry jam - something we normally indulge in when on holiday, or when a pot of Cornish clotted cream finds it's way into my shopping trolley. The recipe I use for rich scones has been adapted from the Be-Ro cookery book. The traditional method is to rub the fat into the flour using your fingertips, but I find that by doing the rubbing in bit with the food processor, your scones are far lighter and more crumbly in texture - you really don't want them to end up too heavy or 'cake like'. Now, for the controversial part! Jam or cream on top? There is a big difference, ask any cream tea aficionado. We can argue about it until the cows come home, but for me it's got to be jam. Why? Well, it just tastes better! Try it and see for yourself! PS. You can use any jam that takes your fancy, it doesn't have to be strawberry. My 14 yr old likes to eat his with a drizzle of caramel on top - kids eh! And if you can't get hold of clotted cream, use the thickest double (heavy) cream you can find. Oh... and they also taste good cold! Heat the oven to 220°C/425°F/Gas 7. In a food processor, pulse the flour, salt and butter to make fine breadcrumbs. If you don't have a food processor, rub the flour, salt and fat in with your fingertips until fine. Transfer the mixture into a large mixing bowl and stir in the sugar and dried fruit if using. Add the egg and milk, reserving a little for brushing the tops of the scones. Stir with a flat bladed knife until the mixture comes together. Knead lightly on a floured surface a couple of times until the mixture is smooth. Be careful not to overwork the dough as this will make the scones tough. 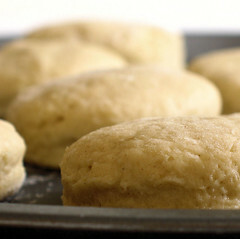 Roll out the dough to between ¾ and 1" in thickness. Cut out rounds using a biscuit (cookie) cutter, any size will do but I like a 2½ inch size cutter. Re-roll the trimmings to use up all the dough. Place on a baking tray and brush just the tops with the reserved egg and milk. Bake for about 10-12 minutes or until well risen and the tops are golden. Split them in half horizontally and serve warm (or cold) with clotted cream and jam. As we are slap bang in the middle of British Food Fortnight, these scones are my entry into this year's blog event being held by Antonia of Food, Glorious Food! Last year's entry was a Hazelnut Cartwheel, a dessert made with pastry and cake crumbs, a bit unusual and different from anything I've made before. Ooh yum - a proper British cream tea is so so good. Your scones look so perfect and I agree, jam on top tastes best! Thank you for your entry. OMG! I love scones... and these pics are so... inviting to eat! In spanish supermarkets there are no double cream or clotted cream to buy. That's why I love your post, it reminds me of those moments I enjoyed in UK. Those scones look delightful and I would truly love one just now. They look lovely with the jam dripping down the side but I'd say my favorite topping is clotted cream, probably because we can't really get it here. There's something about scarcity that makes it taste that much better. These scones look amazing!! My mouth is watering! Oh, my! And I've been making jam like crazy! Those scones look fabulous, very light and buttery. I'm with you cream first then jam. These look fantastic I love scones! Beautiful scones from the very trusted Bero cookery book. Nic - You should get a job as a photograper for Marks and Spencer food. Amazing pictures. Oh my goodness one of my all time favourites Nic and your scones look perfection indeed!! Wonderful entry!! I love carbs, and I especially love scones. And yours are a delight to the eye, and undoubtedly, to the palate. Those scones with clotted cream and jam look so good! I have never had clotted cream. ohmygod ohmygod ohmygod ohmygod! This is one of my all time favourites. The classic cream tea with scones, which look perfect by the way. It has to be Cornish clotted cream for me and I'm a raspberry jam girl. I haven't had scones for years and I wonder why, because your pics remind me of how I love it, especially with blackcurrant confiture! Yum yum yum yum yum...very pretty & absoltuely gorgeous Nic. Love these & am ready to dive in! Coincidentally I posted scones 3 days ago too. The only best scones I ever had was in London. 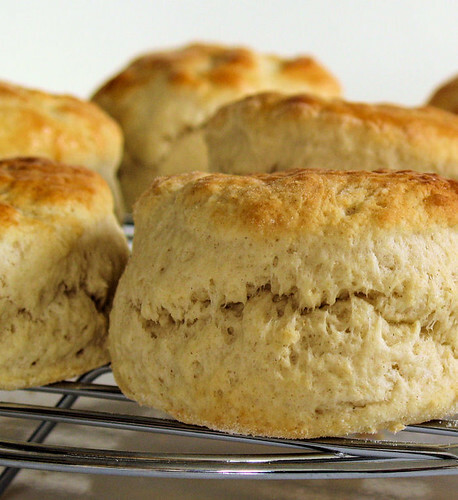 American scones are so different. I definitely miss scones and clotted cream. Jams are good too, but I must have it with clotted cream since I can't find this cream in America. Yours look so delicious! Cheers. Surely nothing can top fresh scones, cream and jam! And your scones look so wonderful... Thanks for the tip about using a food processor - I'll give that a try next time. What a great entry! Those scones look so fluffy and delish. I love scones with jam and clotted cream and the only way one should eat scones. OH that jam dripping down just killed me, I adore jam. These look just delicious! Just delicious! I'm ready for tea time now, and I'll take cream and jam. These scones look very tempting ! I've tried desperately to make some...I will have to try your recipe !! Love the melted cheese on these scones. Clotted cream sounds so bad for you but it's so addictive. Love it on strawberries, too. That looks lovely with the jam dripping over! I love scones but to have an authenic recipe like this, awesome! I like jam and cream. I could sip tea all day, I love cream teas and all those yummy sandwiches and treats. Those scones look lovely Nic. Personally I'm a cream on top girl...you have to squish the cream to put the jam on top, if you put the jam on first you can get more cream on!! Wonderful looking scones, Nic! I especially love the pic where the jam drizzles off the scone - so much YUM! for me it's jam but if I have the choice jam AND cream! mmm your scones look delicous! Lisa - I know what you mean, makes you want it even more! LyB - well these only take 5 minutes to make, you can use up your jam with them! Margaret - that Bero book is great! Jan - that would be so much fun! Grace - oh those drippy drip drips!! Raquel - well the cream and cream cheese sounds good too. Patricia - oh do come over, how about this afternoon? Mike - oh no, I wish I it was something I could pop in the post to you! Helen - you do make me laugh, and I love raspberry jam too! Ronell - you really must make some now. Deeba - that's great that we both had scones on the brain! Elra - thank you. I think American ones are a bit different, more cakey! Aforkfulofspaghetti - right from the oven, mmmmm! Do try the food processor and let me know if you prefer them that way. Maria, Ann and Lisa - thanks so much! Lore - me too, I might have to make some more. Parker - I must say it does look like cheese, but it's not - they are sweet scones! Jude - yeah, it's really bad for you, but you've gotta have it on scones!! Dee - I like to make easy recipes, but yours sounds interesting. How about jam, cream and caramel? lol! Robin Sue - this must be a really old recipe - but a goodie for sure! Miri - thanks so much. I love drizzling jam photos too! bbaking - thank you! I might have to do a poll about it! I've always been a cream on top kinda girl myself, but I think that's because I grew up without the benefit of proper clotted cream, and putting jam on top of airy whipped cream just flattens it into oblivion ;-) THat said, scones are one of my favourite teatime treats and the first thing I learned to bake. Yours look wonderful!